Before books, before blogs and before broadcasts, there were broadsides. Historically, single sheet broadsheet posters were ephemeral in nature. They were developed in the fifteenth century for royal proclamations, official notices and even advertisements. Today, broadsides hang at the intersection of art and literature. Letterpress printed broadsides are valued as fine art designed and printed by a true craftsperson; but also as fine literature featuring stellar poetry or prose. Broadsided! The Intersection of Art and Literature is a national, juried exhibition of letterpress printed broadsides featuring 42 broadsides by 34 artists from across the United States and Australia. The opening reception for Broadsided! will be on First Friday, October 2, 2009 from 6:00-9:00PM at 23 Sandy Gallery. We are proud to also announce our new membership to PADA (Portland Art Dealers Association) and as such, will be open on First Thursday, October 1, 2009 from 6:00-8:00PM. Also featured in conjunction with this exhibition will be Ink & Impact a benefit for the non-profit Write Around Portland, which is celebrating 10 years of transforming lives through the power of writing in community. To mark this milestone, Write Around Portland invited ten letterpress artists to design and print a broadside, finding inspiration in the writing of Write Around Portland workshop participants. Artists creating a broadside for Ink & Impact are: Mare Blocker, Inge Bruggeman, Warren Buss, Clare Carpenter, Diane Chonette, Diane Jacobs, Carla Schultz, Barbara Tetenbaum, Sandy Tilcock and Shu-Ju Wang. Ink & Impact represents a distillation of 10 years and thousands of writers into 10 works of art by some of our region’s finest letterpress artists. The full online catalog can be found here: http://www.23sandy.com/writearound/catalog_wap.html . Broadsided! will be on view until October 31, 2009. Please stop by and see this outstanding and eclectic exhibit. Click here to view a complete online catalog of Broadsided! Announcing the First Friday Eastside Gallery blog! The First Friday Eastside Gallery Guide has found a blog home at WordPress. Over 15 galleries and artists are contributing to the blog, so the updates are guaranteed to be often and exciting. Be sure to add it to your blog list. For complete information about First Friday visit our website at http://firstfridayguide.com/. In the meantime, what are you waiting for? Check out the blog! http://firstfridayguide.com/wordpress/. This is definitely the way to usher in the fall season. 23 Sandy Gallery is excited to present an artist lecture by Holly Senn. Senn will discuss her installation, Tale, this Saturday, September 26, at 5:00 p.m. This is a great opportunity to experience this awesome exhibit and hear from the artist herself. To view more of Senn’s work, check out her online catalog. Also in the back gallery we are featuring the artist books of Barbara Gilbert. Her books are rich with photographic images and unexpected book forms. For a sneak peek of Gilbert’s work, see her online catalog here. 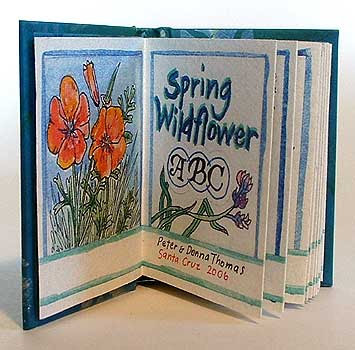 Since 1976 Peter and Donna Thomas have worked collaboratively and individually to create their unique artist books. From start to finish their books are truly handmade. The Thomas’ make their own paper, letterpress print the books, and bind each in their signature style. We are thrilled to offer several of the Thomas’ books in the Gallery. Each one is beautifully illustrated by Donna Thomas and printed on handmade paper made with indigenous materials. These books have a primitive quality and each is inspired by nature, from the most demure botanical specimens in Beauty to the expansive Grand Canyon. These accordion style books are as tactile to the touch as they are lovely to look at. Each volume measures approximately 2 x 3 inches–small in size, big in craftmanship. Under the imprint, Peter and Donna Thomas: Santa Cruz (CA), the Thomas’ books have been shown in individual and group exhibitions in the USA and abroad, and have been purchased for collections around the world. Ask to see their artist books during your next visit to the Gallery. Also showing is Holly Senn’s installation, Tale. 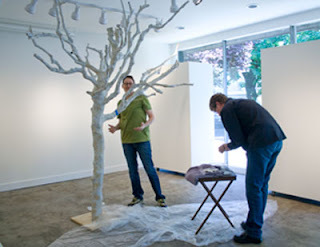 You will be awed by how Senn has transformed 23 Sandy Gallery into a botanical-inspired forest. Both exhibits will be open through September 26, 2009. See Barbara Gilbert’s online catalog here. Jan Owen is a calligrapher and book artist from Belfast, Maine who incorporates traditional, sometimes ancient, techniques and transforms them into contemporary renditions of popular text. Owen’s love of medieval manuscripts, Asian calligraphy, music and poetry is evident. Her work has an architectural feel and incorporates a tapestry of shapes, colors and textures. Often larger in scale than one would expect, many of her pieces are designed to be hung on a wall. Using handmade paste papers, textured surfaces and gilt, a depth of layers is created, each rich and significant enough to stand alone, but in total harmony. Owen, also a former Bangor Symphony string bass musician, has taught at Haystack School of Crafts in Maine, Sitka Center in Oregon, and at the Oregon College of Art and Craft in Portland. Her work can be found in the special collections of the Library of Congress, National Museum of Women in the Arts and Harvard, Yale and Wellesley. She exhibits her work internationally and we are delighted to represent her at 23 Sandy Gallery. Owen’s work is luminous, symphonic, and eloquent. We invite you to come by and take a look. 23 Sandy Gallery is open Thurs.-Sat., noon-6:00 p.m. or by appointment. You can also see more of Jan’s work in the gallery inventory here. And, Mark Your Calendar for Saturday, September 26! This month’s installation in the gallery has been a huge hit! Holly has created a Vod-Cast of her work and we are thrilled to be able to share it with you. You can also learn more about Holly’s installation when she gives an artist talk in the gallery on Saturday, September 26 at 5:00 p.m. Mark your calendar for this inspiring event. Jacob’s Ladder Book and Beaded Leather Binding Coming Up Soon! Join us for two new workshops in the gallery in October. First up is Chandler O’Leary, a Tacoma based book artist who will teach us the a very fun structure based on the classic children’s toy, the Jacob’s Ladder. This magically movable binding makes for an exciting, kinetic hardbound book. Discover the surprises and illusions the Jacob’s Ladder creates by making your own blank book—complete with ribbon fasteners and boards covered with decorative paper. The Jacob’s Ladder also provides many possibilities for beautiful, tricky storytelling—this class will give you plenty of ideas and inspiration. Complete registration can be found here. Then for two Sundays in October we’ll feature Beaded Leather Journal with Painted Papers with Tamara Gerard. This two part workshop is suitable either for beginning or experienced book artists who wish to learn a beautiful decorative technique. On day one, we will prepare a supply of magnificent painted papers. On day two, we will bind those papers into a gorgeous soft-cover beaded binding. Find out more about this terrific workshop here. Also, we are looking for new book arts workshops to bring to the gallery. Deborah Watkins is our new Workshop Coordinator and we are thrilled to have on board to handle all the arrangements for workshops. Email the gallery if you have a fun workshop idea. Wow! Holly did a marvelous job with her botanical forest made from book pages. You are going to love this—our first installation in the main gallery space. Learn more about Holly’s work at our web site. More photos coming soon. Ready to Reopen with a Bang! Join us from 6:00-9:00 p.m.
Summer break has been great, but we are happy to get back to work this week with an exciting new show by Holly A. Senn. First Friday is going to be a blast! 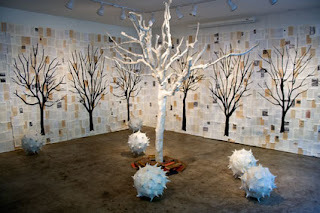 Holly kicked off her installation on Sunday by assembling the 8-foot tall sculptural tree made from old book pages. Tomorrow she’ll line the walls of the gallery with more book pages and complete the installation with seven gorgeous seed pods also constructed from book pages. You are going to love this show. It’s our first full installation in the main gallery! Stay tuned. We have the marvelous art photographer, Dan Kvitka coming to shoot the installation on Thursday. We’ll post the photos ASAP!